So, who is this Plato guy and what does he have to do with the church? • Plato was an essential figure in the development of Western thought. Along with his teacher, Socrates, and his most famous student, Aristotle, he laid the foundations of Western philosophy and science. • His dialogs have been used to teach a range of subjects, including philosophy, logic, ethics, rhetoric, religion and mathematics. • Alfred North Whitehead once noted that a generalization of European philosophy is that it consists of a series of footnotes to Plato. Plato’s writing also influenced the teaching of the early church in fundamental areas. One such subject is what the church believes and teaches regarding the state of the dead. As we have seen from the post, The Soul of America, the biblical use of the word “soul” is interchangeable with the word “person” and that there is little indication that when the Bible speaks of the soul that it is referring to an abstract part of our being that is conscious and lives on after we die. The post also advanced the idea that the concept of an immortal soul has it’s origins exclusively in Greek Philosophy – and by that I mean Plato. When did Greek thought infiltrate Christian teaching on the afterlife? 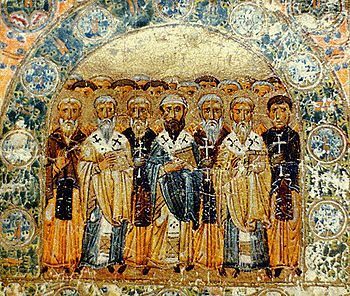 In the period of time following the age of the early church, the Church Fathers were faced with attacks on the new Christian religion from two sides: heresy and the intellectual reaction of paganism. The first few hundred years of the Christian era was a time of the establishment of doctrine – the teachings of Christian theology. This body of teaching, called Patristic speculation, was organized and taught in response to the intellectual attack of the pagans and in order to counter the many false doctrines (heresies) that sprung up continuously all over the known Christian world at the time. • Jewish Legalism – probably the first heresy with which the young church had to deal. This false doctrine taught that circumcision and the Law of Moses were still binding on Christians. • Asceticism – is the belief in severe self-discipline, self-mortification and avoidance of all forms of indulgence, typically for religious reasons. • Antinomianism – anti, “against”, and nomos, “law”, are the two root words from the Greek, “against the law”. This was a heresy that taught that there were no moral laws that God expected Christians to obey. • Docetism – the belief that Christ’s body was not human but either a phantasm or made of real but celestial substance and therefore His sufferings were only apparent. This was an important part of Gnostic belief and had its roots in the belief that all matter was inherently evil. The pagans, early on, didn’t pay a lot of attention to the religion of Christ. As a matter of fact, they scoffed at what seemed to them to be an absurd sect of Judaism which worshipped a dead-and-crucified God. But, as Christianity acquired greater influence and began to reach the higher classes the pagans sat up and took notice. The intellectual attacks began and the new religion had to defend itself. The defense took the form of philosophical arguments advanced in an effort to be seen as legitimate in terms of the Greek philosophical concepts that permeated the world view of the day. These formulated doctrines, some of which are called Orthodox today, ended up assimilating ideas that originated with Greek writers such as Xenophon, Homer and, of course, Plato. This assimilation was inevitable because many of the crafters of the defense “wore the mantle of the philosopher”. The Ante-Nicene Fathers, aka the Apologists, were heavily influenced by Greek thought. 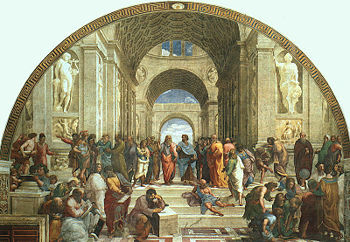 Higher education of the day consisted of schools of philosophy that taught the ideas of Plato. These men were highly educated, some even taught in these schools before their conversion. Justin, Irenaeus, Tertullian, Origen, Athanasius and Augustine – ALL key architects of the defense against the pagans; ALL heavily influenced by Plato. The writings of these men were influenced by Greek philosophy so much, and the passionate embrace of “Christian-Platonism” was so enthusiastic that hundreds of years later, Socrates and Plato were frequently regarded as divinely inspired pre-Christian saints. So, to sum it all up – at a time when the early church is finding its legs, it finds itself defending its religious beliefs against the attack of false teaching from within and Greek philosophy from without. These written defenses, called Apologies, form the basis of a significant part of Orthodox dogma today. But the writers, called the Apologists, argued for Christianity from the point of view of Greek philosophy and, in doing so, opened the door to the influence of pagan thought on Christian beliefs. One of the doctrinal tenets compromised was the biblical teaching on the state of the dead.